What better way is there to spend a lovely, sunny, temperate, summer day than to take a nice long, casual hike in the forest preserve? 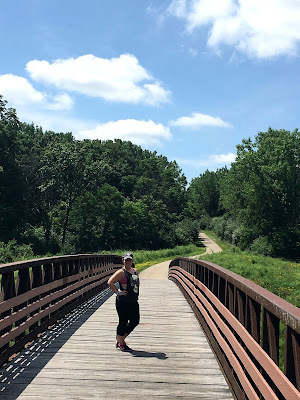 My wife and I feel the very same way; so, when we woke up yesterday morning and saw that there was nary a cloud in the sky and the temperature was going to stay below 80 degrees, we decided to lace up our walking shoes and hit the trail. However, our normal haunts (Starved Rock State Park and the local preserves) are a little tired at this point; thus, we decided to try out a new location this time. After a little bit of cursory Googling, I came across a forest preserve in nearby Carpentersville, IL - Raceway Woods. Obviously, as a noted Indianapolis 500 nut and NASCAR fan, this name caught my eye right away. After reading up on the place, I knew this was going to be our new destination, as it combined my love of Motorsport with our mutual dedication to physical fitness. 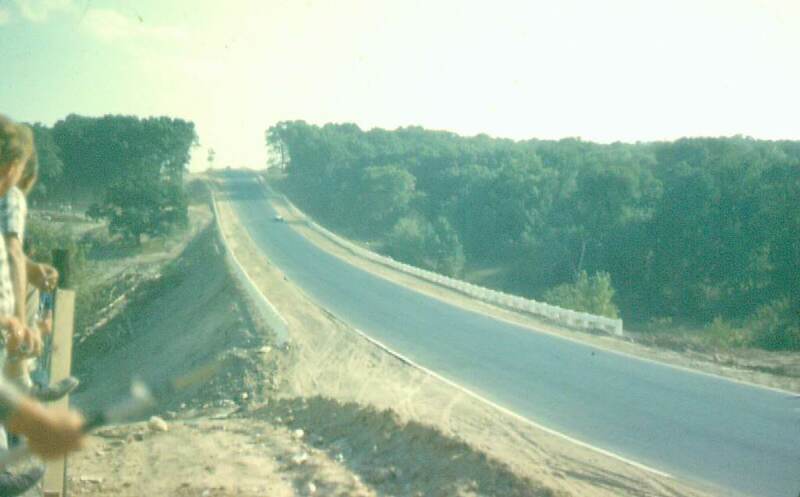 Opened in 1958, Meadowdale was a road course circuit which operated through the 1970 season, hosting a variety of races in several different categories and series throughout it's short history. 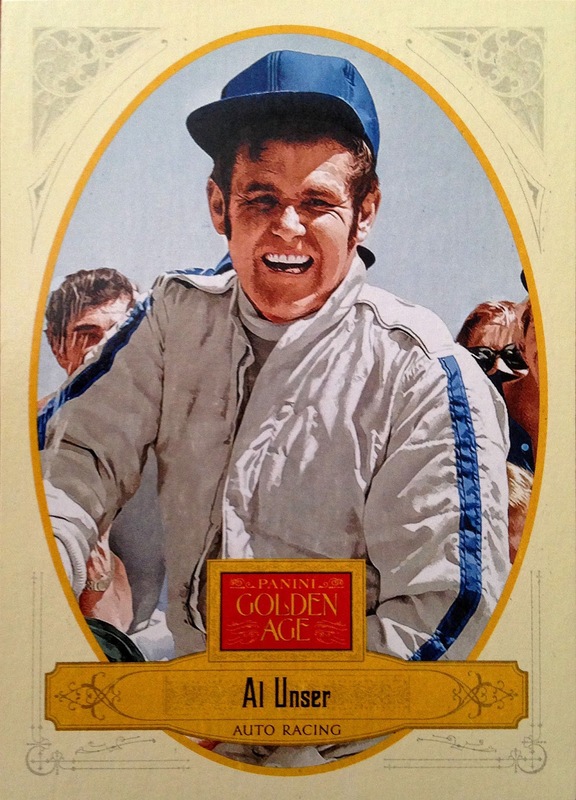 During it's 12 year run, the circuit played host to SCCA, USAC, ARCA, AMA, NHRA et al, while sports cars, stock cars, go-karts, motorcycles, dragsters, and even snowmobiles revved their engines in front of legions of fans. Originally brought to life as an added attraction to a recently built housing subdivision in the Chicago suburb, Meadowdale and it's landmark Pure Gasoline silo was inspired by the famed Formula One circuits across Europe - Monzo, Monaco, Nurburing, etc. In fact, it even had it's own, smaller version of the Monza Wall as part of it's course. However, seeing as the track played host to mostly amateur and lower levels, as well as local automobile club events, the skill sets of the competing drivers were rarely up to par. Furthermore, with it's hurried, almost secondhand though construction, it lacked many basic safety measures, including emergency run-offs, rough and tumble paving, and extremely tight turns. 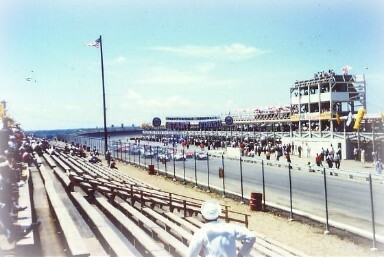 In fact, the very first day of operation saw a fatality on the track in an SCCA event and the track earned a reputation as a killer, nearly dooming the effort from the start. Furthermore, the speedway never did gain much of a financial foothold and lacked the cash needed to make the major alterations to make the track safer. While the few and far between national touring events served as money makers, the major series eventually turned their backs on the track when the requested alterations were not made. After all, no major series is going to put their assets... I mean athletes... at risk, right? 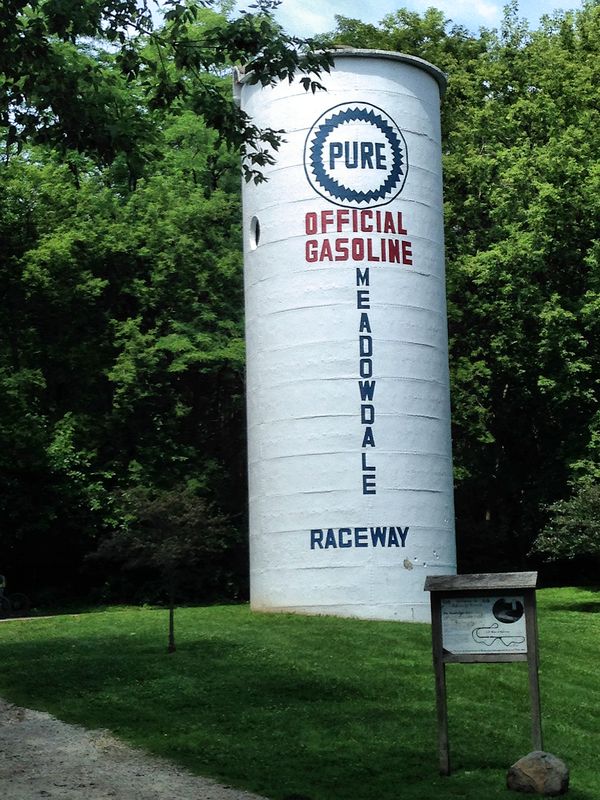 If money problems weren't enough to sound the death knell, the relatively close geographical presence of Road America in Elkhart Lake, WI and Blackhawk Farms Raceway in South Beloit, IL provided ready and safer alternatives to the Chicagoland market. As the old saying goes, adapt or die; Meadowdale International Speedway failed to adapt, leading to an early and abrupt demise in 1970. The main straightway on race day, sometime in the mid-60's. For years and years, the track sat vacated and unattended, while nature slowly reclaimed "Little Monza" and the rest of the facility. Thankfully, in the mid-1990's, a non-profit group was formed to save the "ghost track," rehab the silo, and turn the track into a forest preserve and walking path. Fifty years ago, racers used to push the limits of nerve and speed on hot asphalt - today, soccer moms push strollers on their way to shedding baby weight on the very same surface. I must say, turning the old race course into a nature preserve was a phenomenal idea and a great way to add to the community and maintain the history of the area, all at once. 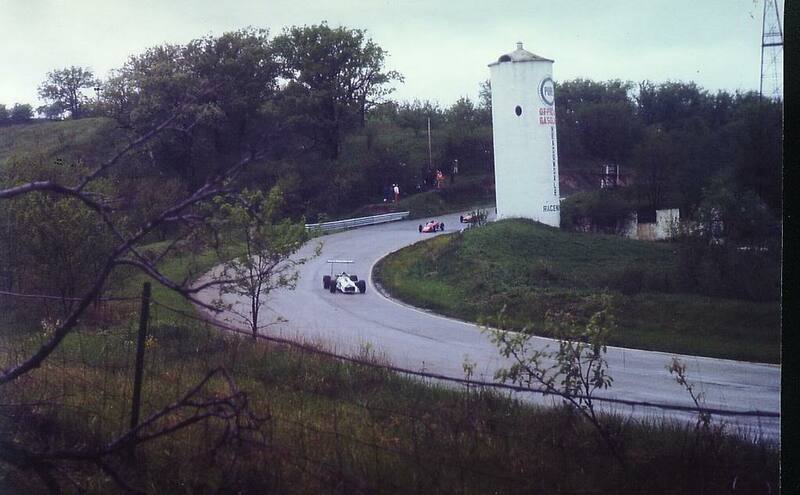 Much like the Rails to Trails program, it's shame that more famous road courses aren't rehabbed in this manner. How amazing would it be to be able to go for a jog around Riverside International Raceway instead of having the historic facility turned into a character-less shopping mall? Despite it's struggles and limited use, Meadowdale International Raceway still managed to attract a large amount of national racing talent - names that are still recognized and revered today. 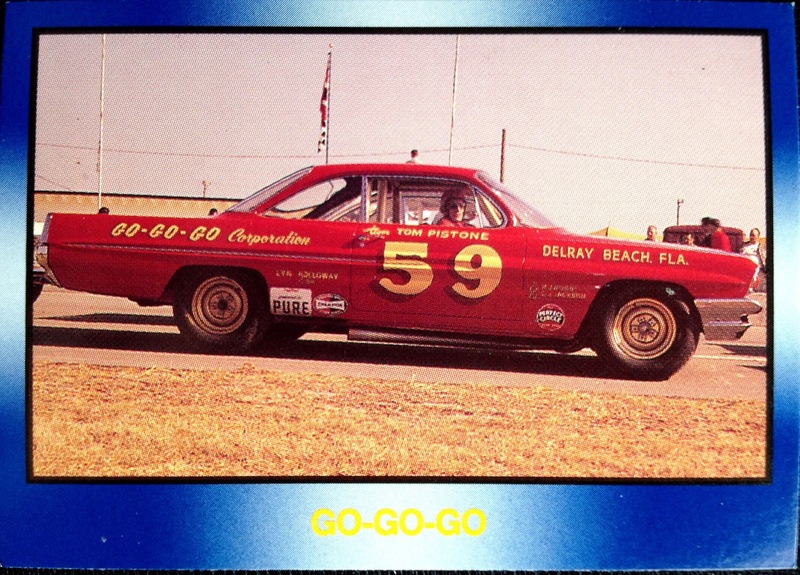 "Fast Freddy" Lorenzen, of nearby Elmhurst, IL and NASCAR fame, took home the trophy in the first stock car race held at the track, which was co-sanctioned by the ARCA and USAC tours in 1959. 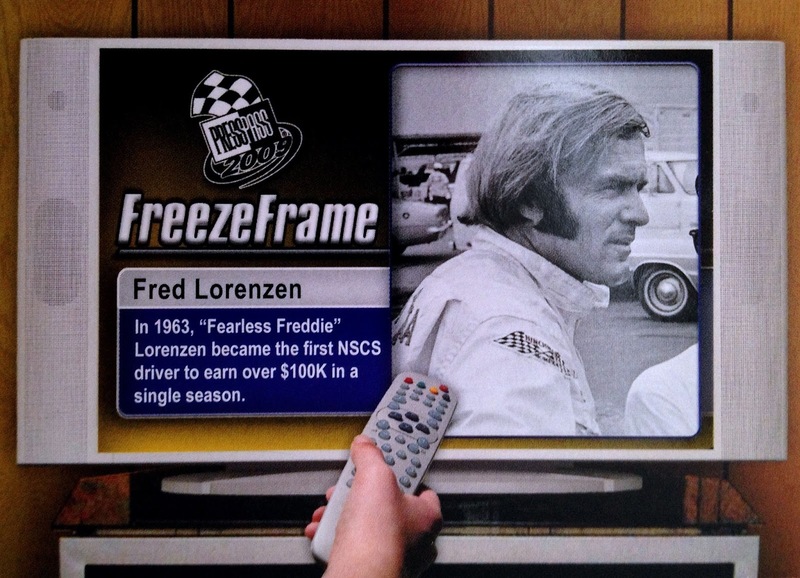 NASCAR never did come to town, but their two main rivals continued to make use of Meadowdale throughout it's existence. Along the way, this paved the way for stock car luminaries such as Curtis Turner, Marshall Teague, Elmer Musgrave (father of Ted) and "Tiger Tom" Pistone to come to town and raise a little hell. In addition, while they never held a champ car/indy car race (though one was tentatively scheduled for 1970, before the gates were closed for good), many big names from the open wheel circuit made their way through Carpentersville through the SCCA US Road Racing Championships, regulars on the race calendars from 1958-64. Unfortunately, while you don't see it nearly as much today, racers from the era were versatile and so addicted to speed that they would hop behind the wheel of whatever vehicle they could get their hands on. With that in mind, Indy 500 champions Roger Ward, Jimmy Bryan, Bobby and Al Unser once turned laps at Meadowdale - 1972 winner Mark Donohue even saw victory lane at the old track in their final big-ticket event (1968 SCCA Trans Am - a one off affair). Similarly, his car owner in that Indy win (and 16x total Indy 500 victor), Roger Penske, took home the checkered flag in a 1961 event, back when he was still in the driver's seat. Furthermore, longtime Brickyard competitors Lloyd Ruby, Peter Revson, and Dan Gurney (who was also one of the greatest sports car racers of all-time) liked to pop in from time to time. The track may have only existed for 12 years, but it sure did see it's fair share of racing royalty take to it's banks. 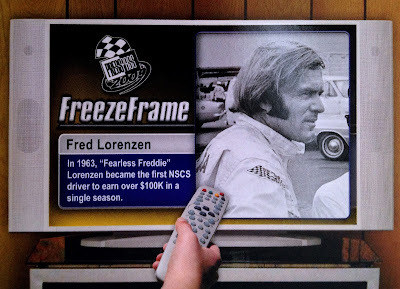 Therefore, I can now say with confidence that Al Unser, Fred Lorenzen, and I have traveled on the very same race track. It may be a lie of omission, but how cool is that? All in all, it was no walk in the park... it was better because it was a walk on a bonafide race track! 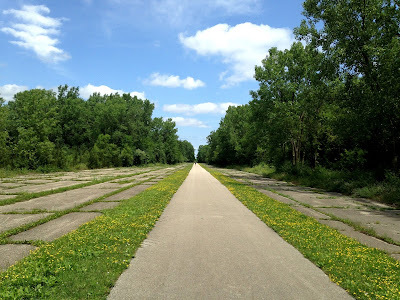 A good portion of the original track surface still exists as part of the path, while retaining walls, bridges, track markings, and the silo remain, keeping the spirit of Meadowdale International Raceway there with you as you navigate your way through Raceway Woods. I want to go again and do some "off track" exploration on my own time and see what I can find... perhaps during the winter when the vegetation isn't quite so thick. At any rate, if you enjoy automobile racing and you live in the Chicagoland area, I highly recommend that you make the trek to Meadowdale. 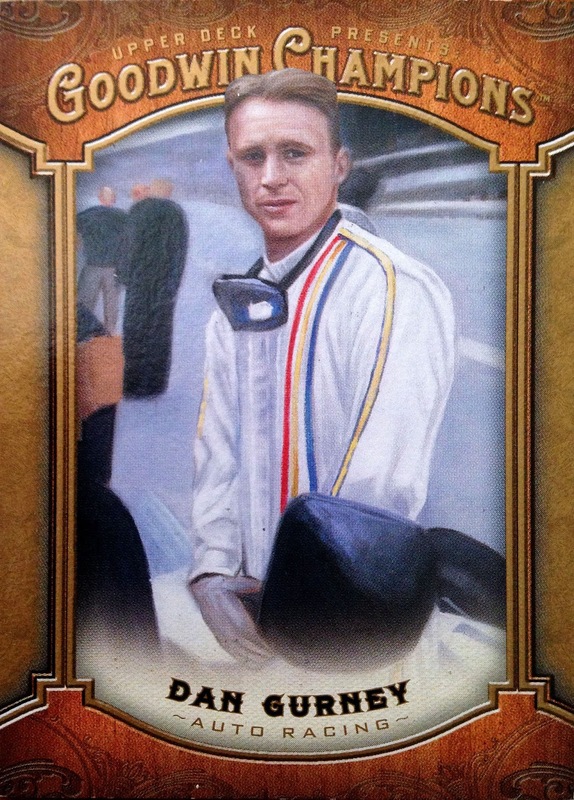 I was so enthused (like a little kid) after the experience, that I immediately pulled out my cards and old race results to see how I could tie this adventure into a card-based blog post. In the process, I found that quite a bit of footage from Meadowdale's halycon days. So,I'm going to leave you with some fairly high quality footage of the "Twenty Grand" Steinbeck Memorial ARCA race, held July 18/19, 1964 so you can really get an idea of what the speedway looked like in action. 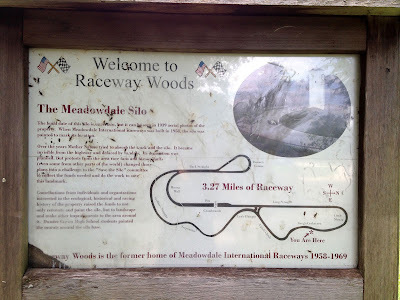 Meadowdale International Speedway may be long gone, bit it's spirit lives on in Raceway Woods. MEADOWDALE INTERNATIONAL RACEWAY, 1 of 3. from Amélie Renoncule on Vimeo. Great post Tony. As NASCAR never raced here I was totally unaware of the tracks existence. Glad to see some use and preservation of it! Very cool. I love walks in the forest... but I've never been to one with an old raceway. Headed to Youtube... there has to be some cool footage of this hike. Time to live vicariously through someone elses shoes. This is so cool! What a great use for the track. I love this history and the efforts to conserve and repurpose the track. The are some large cities (Dallas is one) where too few remnants of their great past remain. What a great place to burn some calories! That looks like an awesome little place. I wish there was a place like that around where I live. Great post, and thank you for sharing. Also, thanks for mentioning Lloyd Ruby. I don't see his name in too many blog posts! Great find and great research. A change of scenery does make the walking more fun. We went up to Starved Rock on 4th of July weekend... what a mistake that was. Soooo many people. No matter which direction you walked/hiked it felt like you were going the wrong direction. This was a great post. Thanks for all of the research and leg work!